Congratulations on taking action to pursue the Certified Master Resume Writer (CMRW) credential! Submission is very simple; just follow the requirements below. 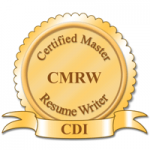 Possess a recognized resume certification (e.g., CARW, MRW, NCRW, CPRW, CMRS). 1. Proof of certification (if it is not issued by CDI you will need to provide a scan of your certificate).